ARE YOU PLANNING AN EVENT AT YOUR HOME AND NEED ASSISTANCE WITH SPRUCING UP THE YARD TO IMPRESS YOUR GUESTS? We're here to help! Call us and we'll come to your rescue by cleaning up and remulching the flowerbeds , adding seasonal color with annuals, and even putting in some potted plants around your deck or porch so that your home will look beautiful and well maintained for your special occasion. Installation of landscape lighting can help with setting the mood for your occasion or help illuminate a dark path or walkway for your guests. 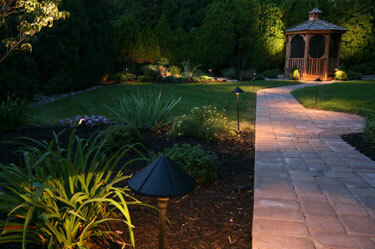 Proper landscape installation will insure less expense over time and greater satisfaction. In my years of landscaping experience, I’ve been required to replant and/or replace numerous landscapes which were originally installed without proper planning and technique. This ends up being more expensive than doing the job right the first time. Dan Eskelson - Clearwater Landscapes, Inc.
© 2016 Ashton Landscaping All rights reserved.